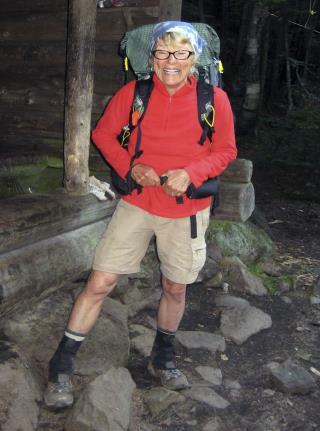 (Newser) – The discovery of a 66-year-old hiker's body off the Appalachian Trail last year made headlines in part for the poignancy of the journal and letters she left behind. “When you find my body,” wrote Jerry Largay, “please call my husband George ... and my daughter Kerry. It will be the greatest kindness for them to know that I am dead and where you found me." The Boston Globe now takes an in-depth look at the futile hunt for Largay, who got lost in July 2013 after leaving the trail to go to the bathroom. The woman whose hiking moniker was "Inchworm" lived for at least 19 days as search teams roamed the woods of Maine. And as the Globe explains, some faulty information may have hindered the search. A simple compass would have prevented all of this. as an avid backpacker you never roam off trail without taking note of your path. I even carry pink tape in my backpack to make myself a path when searching for campsites. It comes in handy....I've had to follow it back to know where I was going. This lady had extensive backpacking experience...I'm very surprised she got lost. How far does one wander off trail to drop a duece? Then get completely lost? I would figure a bush or two in would suffice if it isn't a heavily traveled trail.